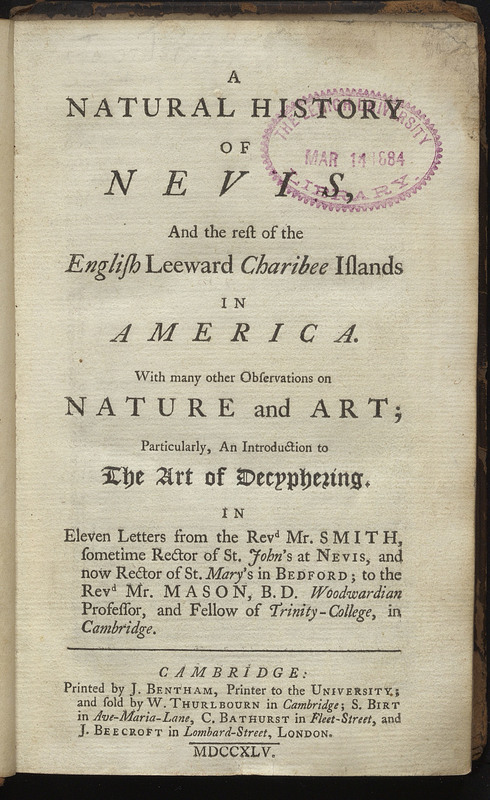 Published as a series of letters in correspondence with a University of Cambridge professor, this work describes the native plants, animals, and people that William Smith observed during his time as Rector of St. John’s Parish on Nevis, one of Britain’s Leeward Islands. Interspersed in the letters about natural history are some discussing cryptography, a topic in which Smith seemed to have a great interest. William Smith, Rector of St. John's, Nevis. A Natural History of Nevis and the Rest of the English Leeward Charibee Islands in America: With Many Other Observations on Nature and Art…. Cambridge [England]: J. Bentham, Sold by W. Thurlbowrn, 1745. A version of this text has been digitized and is available through the Internet Archive. ← -A Voyage to the Islands Madera, Barbados, Nieves, S. Christophers and Jamaica, with the Natural History of the Herbs and Trees, Four-Footed Beasts, Fishes, Birds, Insects, Reptiles, &c.
-Serious Reflections During the Life and Surprising Adventures of Robinson Crusoe: With his Vision of the Angelick World. -A Voyage to the Islands Madera, Barbados, Nieves, S. Christophers and Jamaica, with the Natural History of the Herbs and Trees, Four-Footed Beasts, Fishes, Birds, Insects, Reptiles, &c.